When a tenant is behind on their rent payments or refuses to move out at the end of their term, it can be very stressful, especially if you rely on those payments for your own mortgage or living expenses. Many landlords believe that “the laws favor the tenants,” and therefore feel powerless in this situation. This is not the case, though. The law does not protect a tenant who unjustly fails to pay their rent or wrongfully refuses to move out. What Eviction laws do is impose a process that a landlord must go through before being able to lock a tenant out, to ensure that the landlord has the right to do so. As you go through this process, it is important to keep in mind that if you have done what’s required of you as a landlord, you will prevail. Over 99% of these cases resolve favorably for the landlord, most often resulting in the tenant no longer living in the property. So, while the process may be stressful, keep in mind that it is just a process and that while the length of the process may not feel favorable, the law is actually on the side of the landlord. The best thing you can do for your stress level during an eviction is to not delay beginning the process and to have adequate security. A landlord who has two months’ worth of rent as a deposit and begins the process as soon as rent is late will be much more relaxed about it than the landlord who has no deposit and waits for several months to be unpaid before moving forward. So, what is the process? The first thing to know is that the landlord’s remedy for any breach of the lease by the tenant is to evict. It might seem fair to you to respond in kind to your tenant: i.e., “my tenant breached my lease and did not pay, so I should be able to breach and refuse to make a repair.” But, this is not legal, and will sabotage your right to evict this tenant. If you want the law to rule in your favor against your tenant, you must fully abide by the law. A landlord must fully perform her duties under the lease, regardless of the tenant breaking the lease. With that caveat out of the way, the first step in the eviction process is almost always an Eviction Notice. The Eviction Notice must comply with the legal requirements, or you will lose your case. Because it is the foundation of the entire eviction, I highly recommend having an expert prepare your eviction notice. This could either be an Eviction Attorney, or some other real estate professional or property manager who has prepared notices in the past that have been tested in court. There are generally three types of Eviction Notices. A rent notice, titled “Three Day Notice to Pay or Quit” demands unpaid rent. 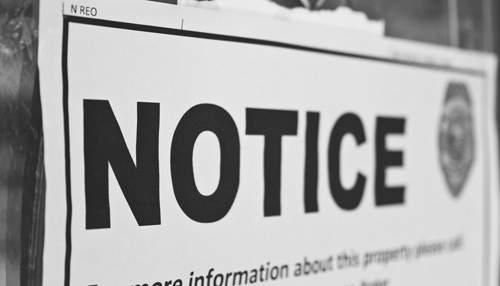 If the tenant is breaching some other obligation of their tenancy, you will start with a “Three Day Notice to Cure or Quit” to demand that your tenant perform their obligations. Lastly, a “Notice of Termination of Tenancy” on 30, 60 or 90 days is used to end a month to month tenancy, or to not renew a lease. This notice is not related to any breach, it is just the landlord exercising their right to stop renting to this tenant. (In rent control jurisdictions, this right of the landlord is limited, and tenancies may only be terminated for specified Just Causes). Once the Eviction Notice expires, if the Tenant has not complied with it, by either paying, or moving out, etc., their tenancy is considered terminated. But, you can’t just go change the locks! The law requires that the Court determine that the tenancy has been properly terminated and so an Eviction Lawsuit must be filed. This legal case, an Unlawful Detainer or “UD”, is the only way to compel your tenant to move out. Many landlords express some concern of taking what they think is the extraordinary step of filing a lawsuit to remove their tenant, but, it is not an extraordinary step – this is the legally required process. The UD starts with the filing of a Complaint, which must be properly served on your tenant, and on certain other occupants. Once service is complete, California law gives the tenant 5 to 15 days to respond, depending on whether the service was in person, or by another method. Good process servers work hard to achieve in person service, to limit the tenant’s time to respond, but sometimes it is not possible. This can happen because the tenant is actively evading service, or simply because the process server was unlucky in their timing. If your tenant is evading service (or you fear they will), do not worry! The law allows landlords to serve tenants at work, to serve them through other residents of the house, and even to serve them by merely taping the papers to their door (after a judge has approved the method). The most your tenant can do by evading is cause a delay – they will get served. If the tenant does not file a response after being served, the landlord can enter a Judgment by Default. On the other hand, if the tenant files an Answer, the landlord will ask the Court to set the case for trial, typically within 20 days, depending on the county and the Court’s schedule. At trial the landlord and tenant will have an opportunity to negotiate a settlement. Many UD’s settle, because settlements can often put the landlord in a better position than winning the trial, and they provide a sure outcome. The settlement will become an order of the Court and will be strictly enforceable if the tenant does not comply. If no settlement is reached, the case will go to trial. At trial, the burden will be on the landlord to prove their case. If the landlord complied with the law as a landlord, and their notice is legally proper – they will win the case and get a judgment against their tenant. Once the landlord has their judgement (either by Default, or after trial), they can have the Court issue a Writ of Possession. The Writ is an order to the Sheriff to remove the tenant from the property. The Writ is delivered to the Sheriff, whose deputies will post a 5 day move out notice at the property. The Sheriff’s deputies will then notify the landlord of the lock out date and will meet her at the property to remove the tenants and restore the property to her. It is common for tenants to request a Stay or Eviction from the Court prior to lockout, which will delay the Sheriff’s lock out date. The Court routinely grants this request, but only if the Tenant pays for the extension of the lockout at the daily rent amount, and the Stay is limited to 40 days. While this delay can be frustrating, you will be paid for the time. The result of 99% of Eviction cases is either that the tenant is moving, or the Landlord has allowed them to stay conditioned on performing all the terms of the tenancy promptly and under the court’s supervision. The Law actually is on your side, even if the process and timing are not. Because there is a process, don’t wait until you are in real financial or other duress to act on a non-paying or unruly tenant. Start the process early and it will be much less stressful. WHAT IS AN EVICTION AND WHAT ARE MY OPTIONS? Providing Eviction Attorney Services in Santa Clara, Alameda, San Mateo counties, and surrounding areas. Fast, affordable and stress-free Eviction Process! Skarbek Law Offices provides expeditious and efficient evictions for landlords. Skarbek Law Offices also advises and defends Restaurant Owners in regards to the myriad legal and business issues they may face.